This Pinup Photo was added on Friday 12 July, 2013. 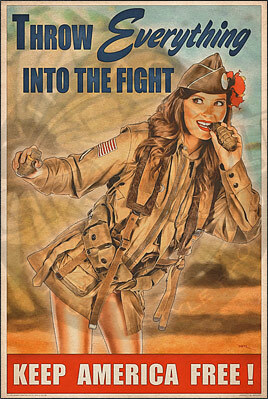 "Throw Everything Into The Fight"
Paving the way during the war in both theaters were the paratroopers. Dropped often from Douglas C-47 aircraft deep behind enemy lines, these paratroopers would fight their way through the country side securing vital objectives so that when the invasion forces linked up with them a stronghold was achieved. These brave paratroopers would often jump at night with the cover of darkness, however often being fired at while parachuting down.